Here at eoutlet we like to look out for the most functional and user-friendly items we can and Tune Belt’s range of sports armbands are just the products we’re talking about. Below are the key Tune Belt products and why they are worth a look. The iPhone has definitely revolutionized the phone market and become a leader in the latest technology. With an inbuilt iPod, you can use your iPhone in any situation and exercising is exactly the market that Tune Belt have tapped into. 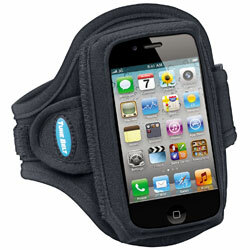 Take the Tune Belt Sport Armband for iPhone AB82 for instance. A perfect fit for both the iPhone 3G/3GS and the iPhone 4, the Sport Armband is designed with your comfort and convenience in mind. 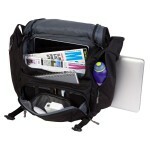 The neoprene fabric is lightweight, soft and flexible, fitting your arm comfortably and securely. The added bonus of the neoprene is its ability to be washed, a key factor when using this item whilst exercising. The clear front window not only protects and shields your iPhone Screen, but it also gives you full access to your iPhone controls, so you can change track and take that important call whilst on the go. However, there is the Tune Belt Open View Armband for Mp3 Players AB8 which carries much the same style as the AB82 but features three holes at the bottom of the armband allowing access in particular to the antenna and headphone jack. The AB8 also allows you to manage and store the headphone cord, which is an ideal solution to it getting in the way whilst exercising. Also, Tune Belt designed the Tune Belt Sport Armband for HTC Desire HD, HTC EVO 4G, Droid Incredible and more AB83 with larger smartphones in mind, but is perfect for your iPhone 4 when in a bumper case, giving it that even more added protection. Not only have Tune Belt developed their armbands for the iPhone, they have also produced a fantastic range exclusively for the iPod in all shapes and sizes. 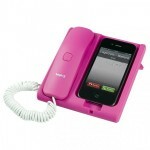 Lets take a look at the Tune Belt for the iPod Touch TuneBelt Sport Armband for iPod Touch AB10. 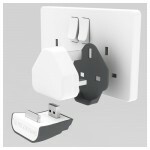 Compatible with all generations of iPod Touch the AB10 allows you to position your iPod Touch either the correct side up or upside down so it can be viewed whilst exercising. The flexible and washable neoprene material means your Tune Belt armband can be used again and again, each time as new. Then, they have the Tune Belt Sport Armband for iPod Nano 6G – use WITH or WITHOUT Nike+ Receiver AB76+ exclusively for Apple’s latest iPod Nano 6G. Small and lightweight with that neoprene material making an appearance again, this nifty little armband is the ideal partner for any one wanting to utilise their iPod Nano 6G. As well as the iPod Nano 6G, Tune Belt have also produced a range of armbands exclusively for the other generations of the iPod Nano, adhering to the belief that the iPod Nano in its small guise is the perfect exercise companion. Take the Tune Belt Sport Armband for iPod Nano 5G AB75 designed for the iPod Nano 5G or the Tune Belt Open View Armband for 3G iPod Nano AB73 for the smaller, squarer iPod Nano 3G. There is also the Tune Belt Sport Armband Plus for iPod Nano 5G AB75+ which is designed to hold the iPod Nano 5G plus the Nike Sport Kit Receiver, for tracking your workout (see Nike+ iPod Sport Kit (includes sensor and receiver)). Then there is the same for the iPod Nano 4G, with extra room for the Nike Sport Kit Receiver Tune Belt Nike+ Armband for iPod Nano 4G AB74+. Again, the iPod Nano 3G version has much of the same advantages Tune Belt Open View Nike+ Armband for iPod Nano 3G AB73+ Tune Belt also offer a simple and neat solution to the carrying of the 1st and 2nd generation iPod Nano’s in the form of the Tune Belt Open View Armband for iPod Nano 1G/2G AB7 Unlike the later versions of the armband, the AB7 features a classic design with a soft and flexible feel, light and washable ensuring your iPod Nano is safe at all times. Finally lets not forget some of Apple’s earlier iPod designs. Tune Belt definitely haven’t with the Tune Belt Open View Armband for iPod Shuffle 2G AB62 which stores your iPod Shuffle 2G securely and safely, allowing complete access to all controls and keeps the headphone cable tidy and under control. 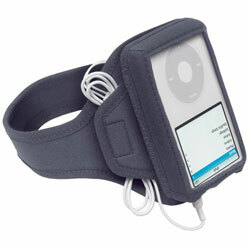 And for all of those who still cherish their 4th Generation iPod, Tune Belt have an armband for you Tune Belt Neoprene iPod Open View Sport Armband AB5. Featuring a cable tidy and full access to all ports and controls, this armband will mean that you can still exercise away without having to update to a newer iPod. The same is true for the Tune Belt Open View Carrier Belt for iPod Video iP2 with its secure and made to measure fit, ensuring your iPod Video is safe all along the way. The Tune Belt Armband Carrier for MP3 Players AB3 is a universal armband for all MP3 devices up to 3 inches but is ideal for any iPod user. The tight elastic ensures your your device is stowd safely away while you exercise. The only downside of the AB3 compared to the other Tune Belt Armbands is the lack of a viewing screen but the soft and secure all over protection definitely make up for it! And if all that wasn’t enough, Tune Belt have an added a little extra. Their Tune Belt Armband Extender EX3 for use with Tune Belt Armbands is designed to extend the length of the standard armband that comes with all their products and is ideal for the those with a slightly larger arm or when you wish to wear your Tune Belt over a jacket adding an extra 6.5 inches to your Tune Belt. Finally, if strapping your iPod to your arm is not quite for you and you prefer a more classic carrying solution, look no further than the Tune Belt Waist Carrier for iPod iP1 Strap the Tune Belt around your waist for hands-free carrying. Your iPod will be stored safely and securly inside a tight fighting carrying solution allowing you to get up and get going.